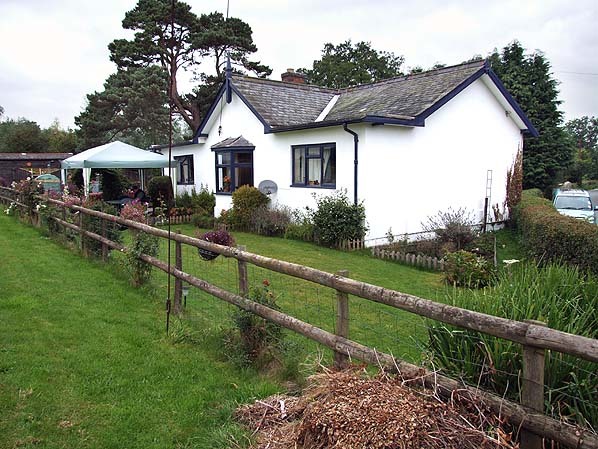 Present state: The station building is largely unaltered apart from the removal of the waiting shelter and ticket office which have been replaced with an extension to the building. The degraded platform still remains in front of the building. A grounded van body in the former goods yard has been there for over 70 years. 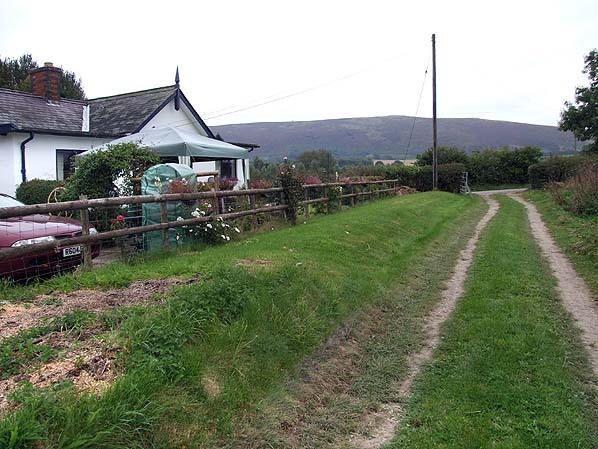 Notes: The railway follows the course of the River Onny as far as Eaton station, crossing and re-crossing the river as it passes down the valley. At Eaton, where the landscape opens out, the line swung to the south towards Bishop’s Castle over open countryside. Eaton was the scene of the great flood of 1886. It is unclear if Eaton station opened with the line as it first appeared in public timetables in March 1866. Initially trains stopped only on Fridays, with a full service in operation in August or September 1866. 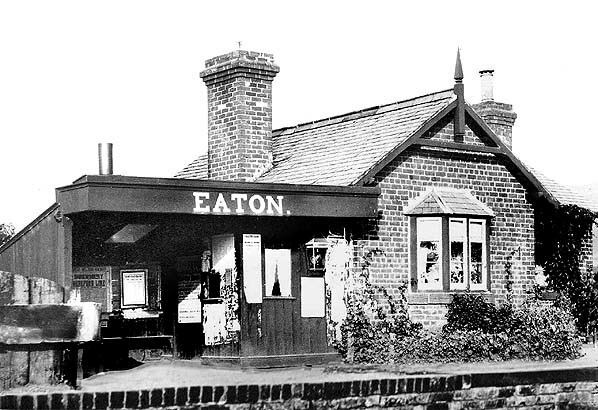 Eaton was never a busy station, and most trains stopped only by request; however the mid morning down Friday train and the last returning up Friday train were timetabled to call. 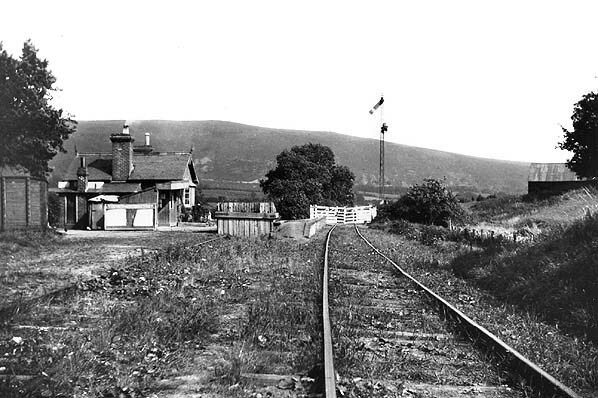 The station was temporarily closed between 27 February and 2 July 1877.
end faced the platform and the other two faced the road. A bay window overlooked the platform. An open-fronted waiting shelter, with an overhanging canopy and an adjacent ticket office, was attached to the north end of the building - which was very similar to that at Horderley. There was a short siding on the down side at the north end of the station, running up to the end of the platform. There was no signal box; instead there was a ground frame at the south end of the platform controlling both the level crossing and access to the small yard. The station had only basic goods facilities and did not handle livestock. 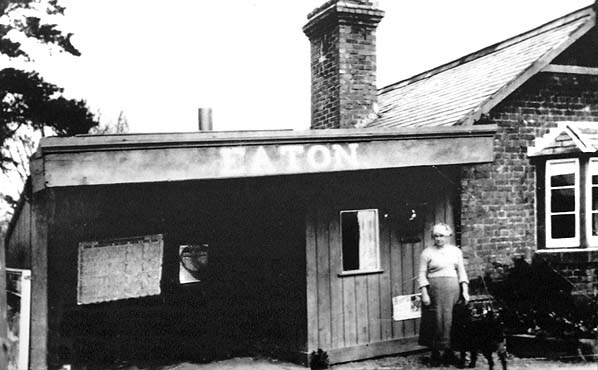 Eaton had no stationmaster but was looked after by Mrs Annie Bason, a stationmistress of character who, if there were no waiting passengers, would signal the train through at walking pace. Newspapers and packets would be thrown out onto the platform while any more fragile parcels would be carefully lobbed into Mrs Bason's outstretched skirt! Tickets from Michael Stewart. except 90 Brian Halford. Bradshaws from Chris Totty. Route maps drawn by Alan Young. 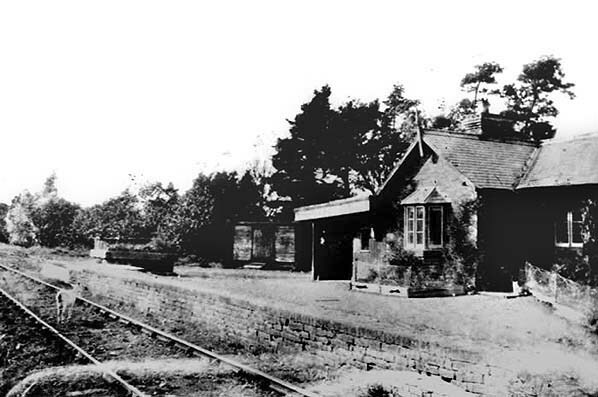 Eaton station in 1906. 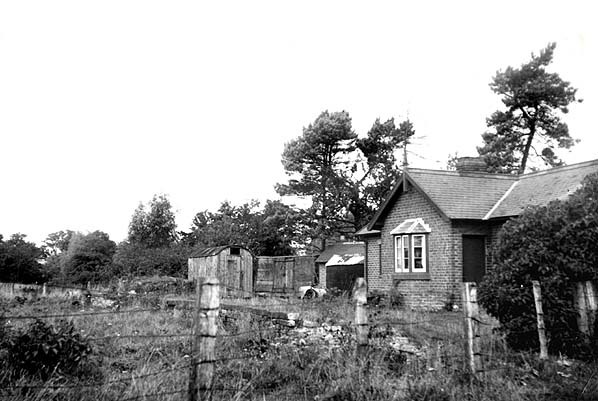 The timber extension to the stationmaster's bungalow comprises the open-fronted waiting shelter and the ticket office. 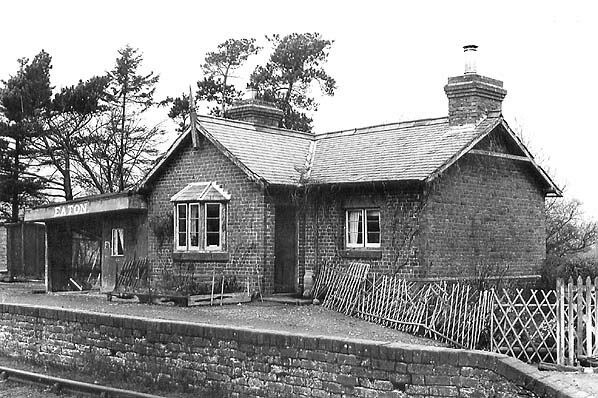 The station building was very similar to that at Horderley but did not incorporate the ticket office. 1902 1:2,500 OS map. The only difference between the two maps is two new buildings in the goods yard to the north of the station building. 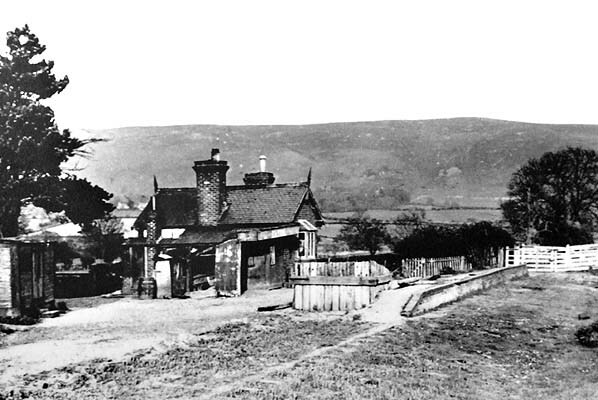 Eaton station looking south-east in the early years of the 20th century. 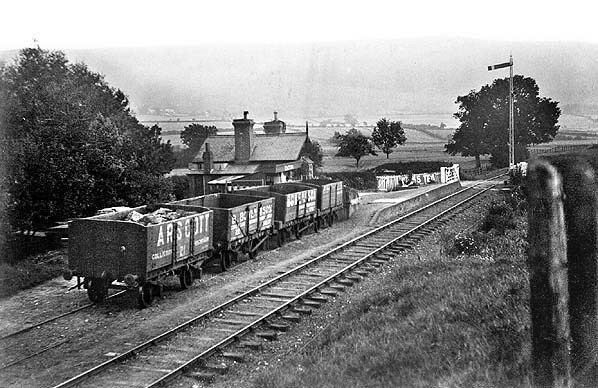 Four wagons stand in the single goods siding. The level crossing beyond the platform was the second of two level crossings on the line, the other being at Horderley station. Annie Bason, the stationmistress at Eaton. Note the bay window which gave her a good view of the platform and level crossing. 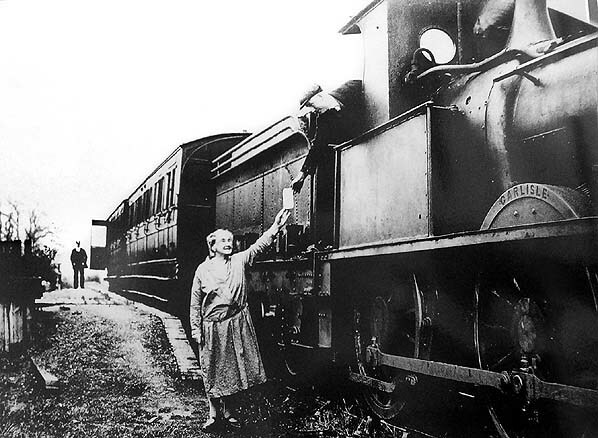 In February 1932 Annie Bason hands a letter to driver George Hotchkiss on the footplate of 'Carlisle'. Guard Tom Cadwallader waits at the rear of the tgrain. Eaton station and goods yard c. 1930s. Note the grounded van body which will appear in several photographs below and is still there today. Eaton station looking south-west c. 1930s. Although the main line clearly still sees regular traffic, the goods yard is overgrown and has probably welcomed no trains for some time. Officially the yard remained open until the closure of the line. The Eaton station building was beginning to look dilapidated by April 1936, a year after closure and shortly before the track was lifted. 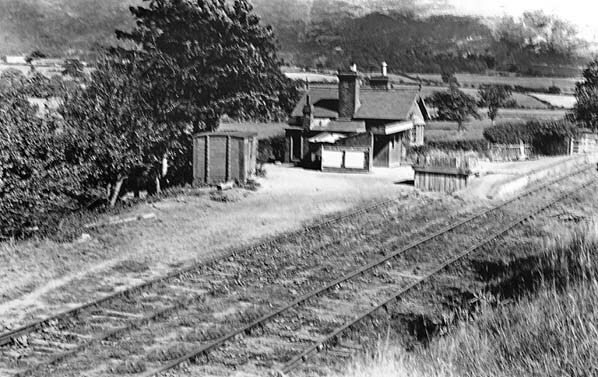 Eaton station later in 1936 after the track had been lifted. Eaton station looking north-west in October 1949. 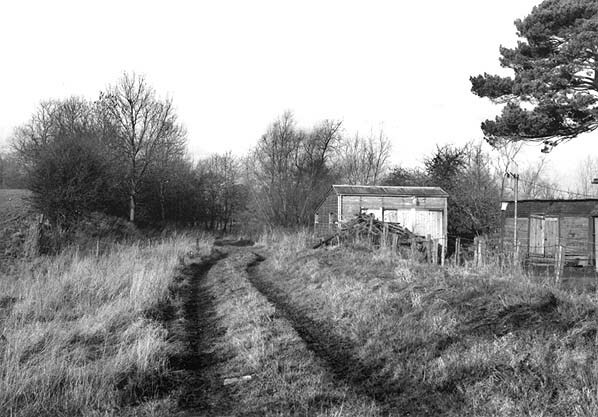 The degraded remains of Eaton station platform January 1985 after all the edging had been removed. This view is looking north-west. The grounded van body is seen on the right. Eaton station looking south-east towards the level crossing in September 2009. The degraded platform is seen on the left. Eaton station building seen from the level crossing in September 2009. An extra room has been created between the two visible gable ends and a further room has been added at the west end of the building on the site of the waiting shelter and ticket office.